Hounds bay at a dark figure obscured in the thick branches of a tree towering above. “Right here, Bryan, a headshot right there,” a man says. The barking drones on repetitively, at the cadence of an alarm clock. Then, a snap of rifle fire erupts. For just a second — silence. Then a bear tumbles from the tree, smacking a few branches on the way down and hitting the ground like a sack of potatoes. Several men rush through ferns and around trees to the drop zone. “I’m going to hit it again in the neck,” says one man. Another steps forward and lifts the bear’s eyelids with his fingers, then tells a companion to let the barking dogs loose on the bear. Dogs rush the bear and sink their maws into its fur. They twist their heads violently and wag their tails with barking now muzzled by flesh. “You get it on video?” someone asks. 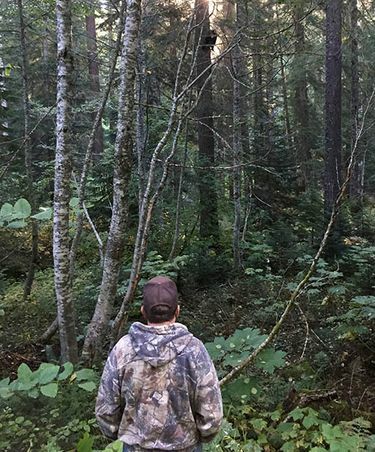 MORE THAN A DOZEN SCENES like this, recorded on cellphones, are now evidence in an investigation of a network of alleged poachers in Southwest Washington. Washington Department of Fish and Wildlife (WDFW) investigators believe the videos, which were taken by the subjects of a lengthy investigation, show dozens of illegal wildlife kills. Since August, the Skamania County prosecutor has charged eight people with 191 criminal counts, including 33 felony charges. In this case, 80 of the counts were for unlawful hunting of big game. That’s nearly as many charges as WDFW investigators pursue in a typical year, according to the agency’s case disposition data. Fish and Wildlife investigators say they’ve never seen a case this big, or this disturbing. “It’s an eye-opener about what’s going on in these woods,” said Officer Denis Budai. Poaching — unlawfully taking fish or game — can describe a number of crimes: Not having a proper license to hunt, hunting out of season or hunting in restricted areas. Using dogs on recreational big-game hunts is also illegal, as is leaving carcasses to rot. In this case, bears and bobcats were allegedly cornered by hunting hounds before being shot and left to waste. 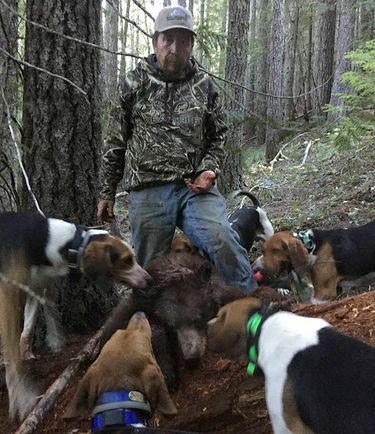 Evidence collected by police shows much of the hunting was done in broad daylight in the Gifford Pinchot National Forest in Southwest Washington. But investigators say they might’ve missed it if not for images caught after nightfall by a motion-sensitive camera. Officers never received a tip about the suspects. They believe the suspects used lookouts and radios to avoid detection. “If I miss this, what else have I missed?” wondered Sgt. Brad Rhoden, who managed the investigation. What motivated these suspects to allegedly kill the animals will almost certainly be a topic of courtroom discussion. It wasn’t for meat or hides, which often were left behind. None of those charged answered a reporter’s questions about the alleged crimes. Most could not be reached. One hung up on a reporter. Lawyers for three suspects declined to comment. Officers wonder if a culture of selfie sticks and social media fueled them. “Nowadays, with social media, people want likes on Instagram and Facebook and bragging rights with buddies,” said Officer Tyler Bahrenburg, who helped work the case. If it did not motivate, that impulse to share certainly helped unravel the conspiracy. Over nearly nine months, investigators stitched together hundreds of text messages, videos, photographs and social-media posts to develop this case. 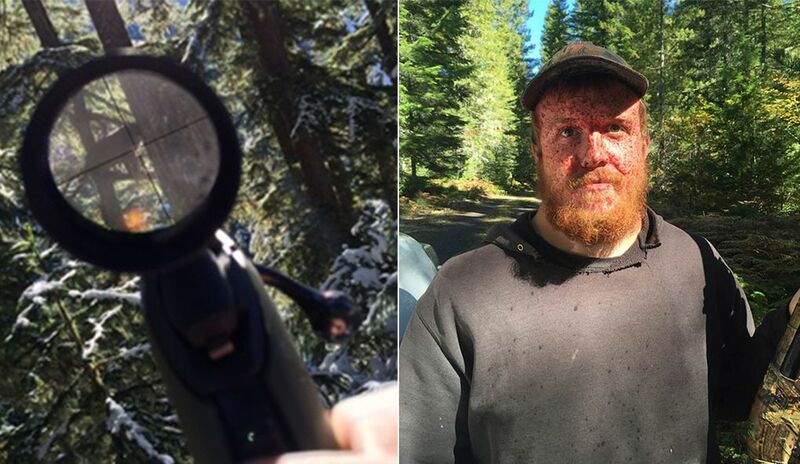 One suspect, William J. Haynes, allegedly texted his mother a selfie of himself covered in splatters of a bear’s blood. “We were a little close when they shot it haha,” he wrote. 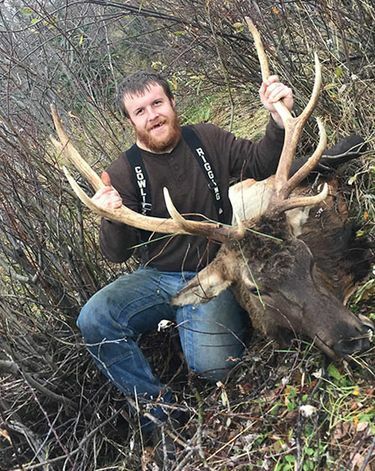 Another, Joseph Dills, who pleaded guilty to poaching charges in 2008 as part of a group whose members called themselves the “Kill ’Em All Boyz,” posted photos on his public Facebook page that showed him posing next to the heads of two bucks police believe were killed in Oregon and illegally brought to Washington. In another photo, Dills and Haynes stood in front of a pickup truck with hunting dogs in the bed, two dead bobcats on the hood, and their middle fingers raised at the camera. Members of the group also shared videos in private Facebook messages of hunting dogs chewing on bears. 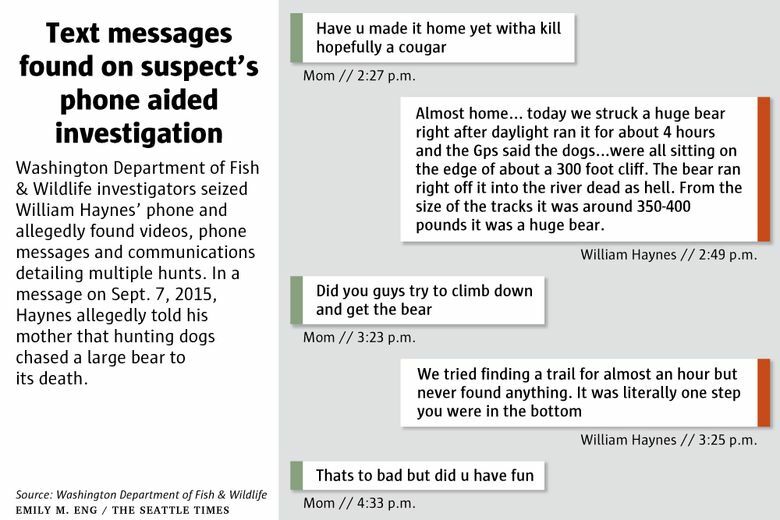 They planned hunts via text message. In a message from March last year, Dills told Haynes his father was setting up a camp at a lake they’d visited previously. “ … you ready for that again? All that death and caos [sic]?” he asked. Haynes replied with an expletive in the affirmative. As the suspects tracked game, their phones tracked them. GPS coordinates attached to photos and videos found on seized phones led to dozens of kill sites where police say physical evidence could be found to corroborate charges. 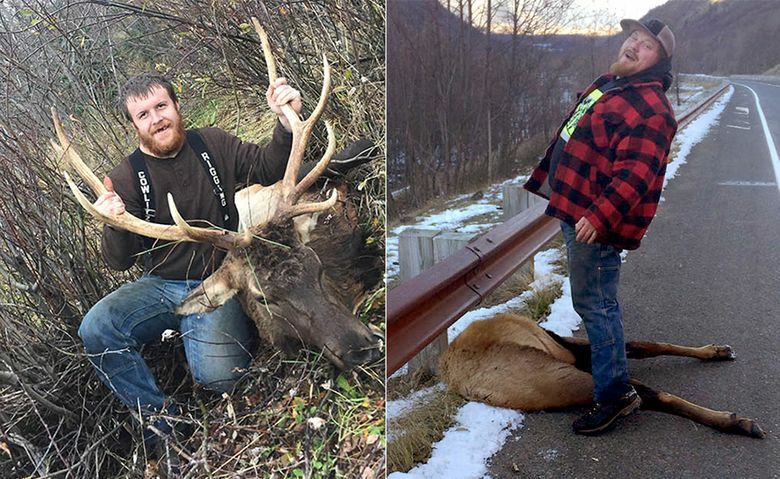 Selfies and text messages also revealed a broader network of illegal hunters, police said. Every phone seized under search warrant seems to yield more suspects. Rhoden expects several more rounds of charges as investigators comb through more digital evidence. THE INVESTIGATION hardly started as a barnburner. So far, there are more than 190 charges related to this poaching investigation. 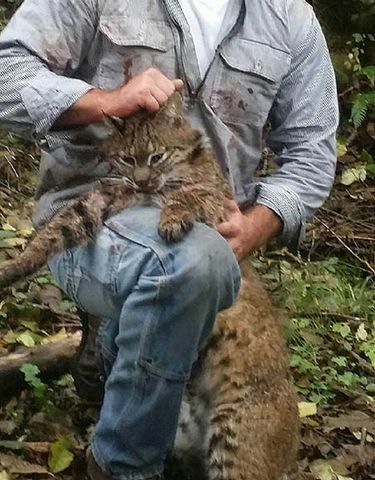 Bryan C. Tretiak, 31; Aubri N. McKenna, 35; Kyle S. Manley, 35; and a 17-year-old girl all face at least one count of misdemeanor unlawful hunting of big game, and at least one count of hunting bear, cougar, bobcat or lynx with the aid of dogs. The 17-year-old was also charged with one count of waste of fish and wildlife. Last November, Oregon State Patrol officers, using a motion-triggered camera, captured images of people in a Toyota truck shining a spotlight on national forest land near The Dalles, according to WDFW investigative reports. Two people were seen getting out of the truck with rifles and head lamps. The Oregon troopers suspected the men were spotlighting, an illegal method of hunting animals whose eyes shine brightly when hit with lights in the dark. Soon after, the officers found a headless deer carcass in the forest near where the truck was spotted. 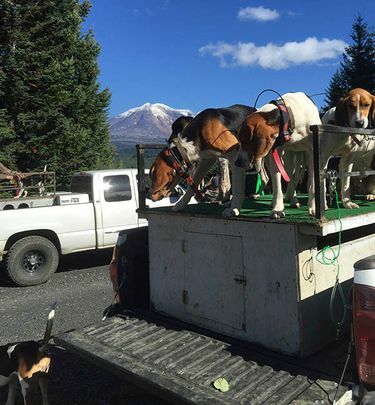 A few days later, on Dec. 3, the same troopers recognized the truck during a patrol, according to WDFW reports. They pulled it over. Haynes and Erik C. Martin soon confessed to killing two bucks and a silver-gray squirrel, according to the reports. They admitted to taking the deers’ heads back to Washington. Oregon police got in touch with WDFW officers, who followed the suspects to the home Haynes lived in with his father. WDFW officers received consent to search the home, according to the reports. Inside the garage, the officers found “a freshly-cut deer head,” according to report written by Budai. Out in the backyard, “the odor of rotting flesh was very strong,” he wrote. Hidden behind an old truck, the officers found 12 deer heads. Seven were wrapped in plastic bags, two were rotting with maggots, two more had been cut and cleaned into skull caps. Officers later found a pair of fresh antlers hidden inside a tire. According to the reports, Martin told an officer he had more deer skulls at his house. By night’s end, the officers had seized 27 buck deer heads, most of them from Oregon, according to a probable-cause affidavit filed in Skamania County Court. 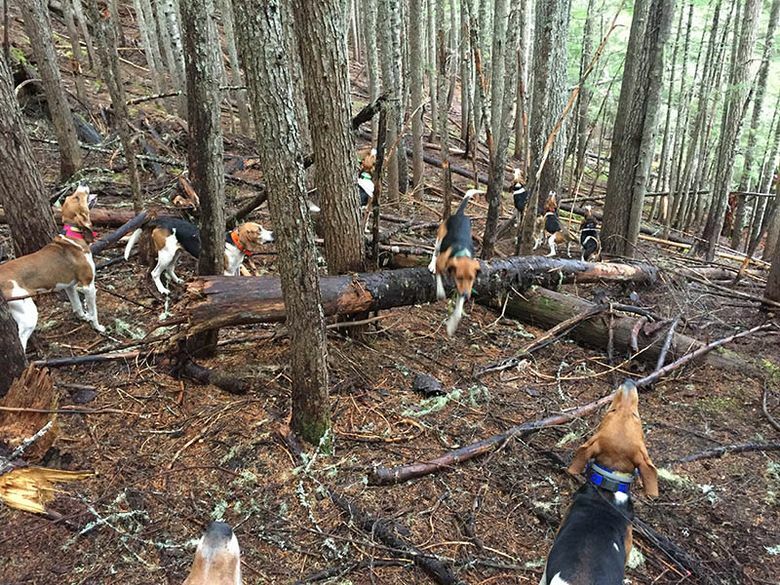 Oregon police are still investigating these hunts for possible crimes. WDFW investigators also seized the men’s phones and obtained warrants to search them. The phones yielded four new suspects and “over 50 instances” of unlawful hunts, according to the reports. 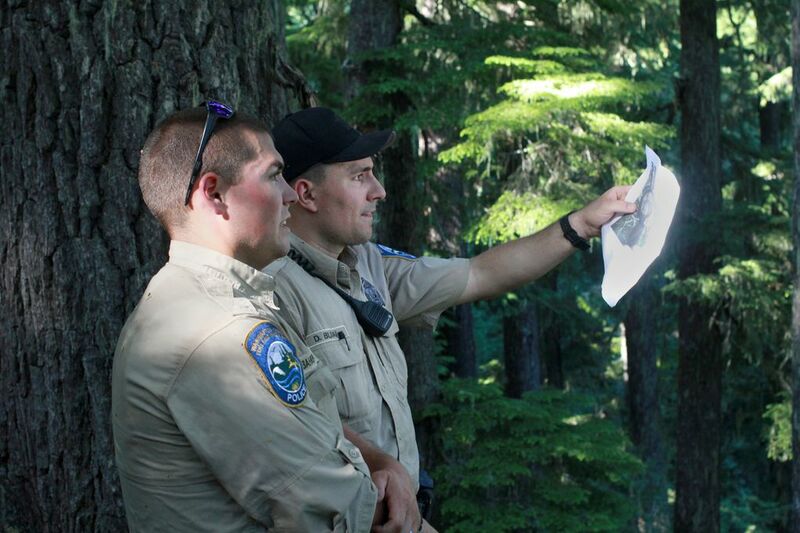 By investigation’s end, the officers would visit about 20 kill sites in the Gifford Pinchot National Forest. 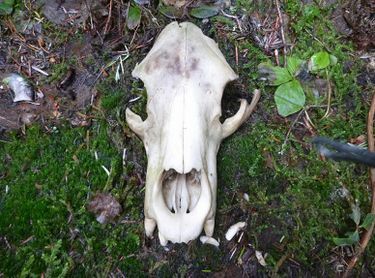 ON A SUNNY DAY in July more than eight months after the investigation began, officers were racing the clock to search for physical evidence at kill sites in the Gifford Pinchot National Forest. Washington’s statute of limitations restricts prosecution of gross misdemeanor crimes to two years after they occur. But lingering winter snowpack and washed-out roads had kept officers at bay. Soon, the officers set out on a hike with their eyes glued to their GPS devices. Then, they came to a halt before a pine tree with heavy boughs. A pile of bones sat at its base. Budai waved a metal detector over the ground near the bones, which would occasionally let out a beep as if it were a supermarket checkout. “I picked something up,” Budai said. Bahrenburg pulled some latex gloves from his pack before crouching in the brush. The two picked up a pile of matted fur thick with pine needles and sticks, and crumbled it through their hands, searching. Budai picked out a two-inch bear’s claw. A few minutes later, he pulled a deformed mass from the pile — a shotgun slug. The officers fanned out and scanned the understory for a shell. They might be able to make a forensic match to one of the suspects’ guns. The slug was more important, though. Suspects had told officers they had allowed their dogs to tree the bear, but hadn’t killed it, Rhoden explained. Now packed away in Bahrenburg’s pack, the hunk of metal could remove an argument in court. 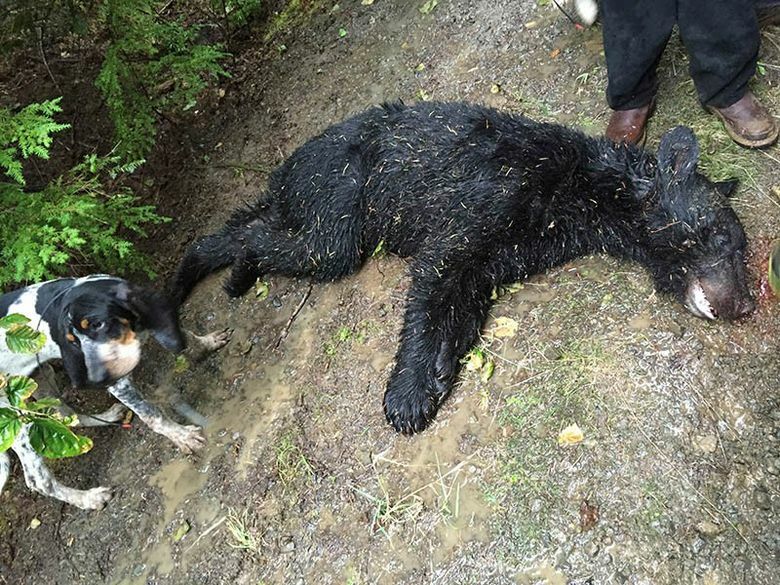 “That takes away the idea that it [the bear] died of natural causes,” Rhoden said. At times, the officers’ task seemed absurd. “Finding a single tree in the forest,” Budai said later that day en route to a second site as the officers scrambled (and sometimes tumbled) down an embankment steep enough to be a ski hill, thick with vines and old-growth trees. 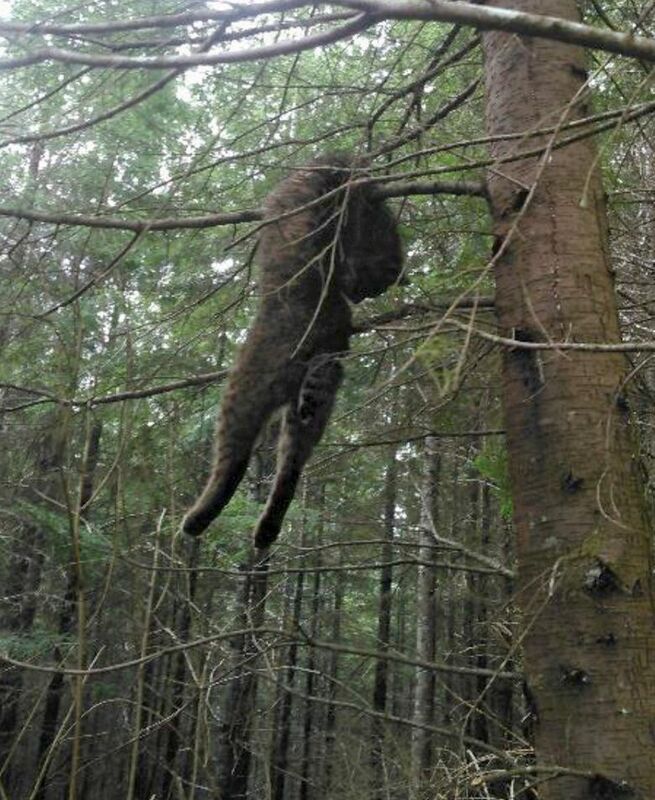 They were tracking down GPS coordinates attached to a video that showed a rifle scope lingering over a bobcat sitting atop a hooked tree. Within a half-hour, they spotted the same crooked limb, and photographed the area. POACHING IS an age-old practice. Present-day poachers kill for “a variety of reasons,” said Steve Eliason, a sociology professor at Montana State University. Sometimes, it’s a crime of opportunity, Eliason said: A massive buck runs by and a hunter can’t resist. Some are hoping for a payday. Bahrenburg said a bear’s gall bladder can fetch hundreds on the black market. For others, poaching can serve as protest. “Some people may do it as a type of rebellion. They may be angry at the government,” Eliason said. Or they may merely seek thrills. In this case, text messages outline planning, and there’s no evidence any animal parts were sold, WDFW investigators said. Many times, the alleged poachers left entire animals to waste, so they weren’t always seeking meat or a physical trophy. In the digital age, however, trophies aren’t always physical. For these suspects, grisly photos and videos may have been the ultimate prize.